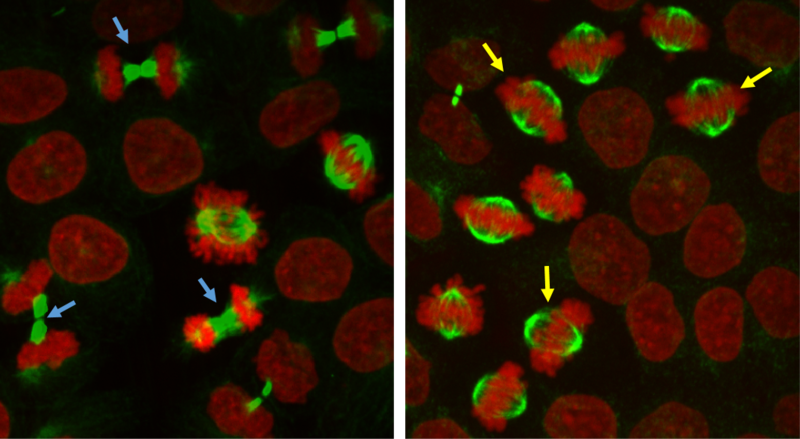 Control dividing cells separate their duplicated chromosomes normally to the two daughter cells (left, blue arrows) as compared to cells expressing a mutated form of Cdt1 that is defective in binding to microtubules and exhibit severe delays in accomplishing this task (right, yellow arrows). These findings could inform more effective cancer treatments and help answer larger questions about molecular mechanisms, according to Dileep Varma, PhD, assistant professor of Cell and Molecular Biology and senior author of the study. The protein, CDT1, helps facilitate DNA replication during the initial part of the cell cycle, called interphase, during which DNA is replicated and checked for errors, before being separated into two daughter cells in the latter part of the cell cycle, called mitosis. During mitosis, microtubules pull the replicated chromosomes into two separate strands, one for each daughter cell. These microtubules manipulate the chromosomes using another protein complex called Ndc80 as a connecting structure. Ndc80 is located at specialized structures referred to as kinetochores located on the chromosomes, where the complex binds to microtubules. It was previously known that CDT1 was present in high concentrations during the early part of interphase, corresponding to its replication function, after which the protein is degraded. However, it was recently discovered that levels of CDT1 also rose during mitosis, suggesting it had an additional, unknown function at this stage. Towards exploring this discrepancy, the investigators created cells with dysfunctional CDT1, and found that these mutant cells stalled during the mitosis phase and never correctly divided in two. Further analysis showed that CDT1 was required to physically connect Ndc80 and the microtubules, linking the two structures together efficiently, according to Varma. 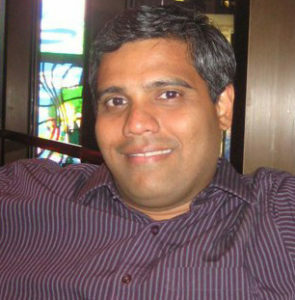 Dileep Varma, PhD, assistant professor of Cell and Molecular Biology, was the senior author of a study published in the Journal of Cell Biology. This newly discovered function of CDT1 has potential implications for both patient care and basic science. According to Varma, cancer drugs targeting CDT1 could improve on current therapies because CDT1 is active in two separate phases of the cell cycle. On a larger scale, a single protein performing both DNA replication and microtubule binding is peculiar, and may hint at a common evolutionary origin for both mechanisms, according to Varma. Other Northwestern Medicine authors include Shivangi Agarwal, PhD, postdoctoral fellow in the Varma laboratory and Kyle Smith, a sixth-year graduate student in the Driskill Graduate Program for the Life Sciences. This work was supported by National Cancer Institute grant R00CA178188 and an American Cancer Society Institutional Research Grant.